Fun, functional products that don't cost the earth ! 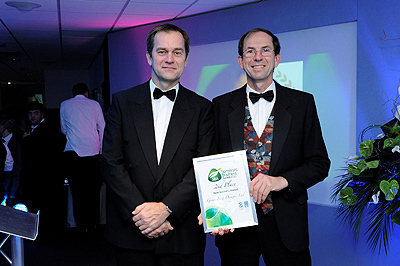 second place at the 2011 Somerset Business Awards! Green Frog Designs was formed in Summer 2009 by Adrian and Marcus Morgan to design and manufacture precision made products from recycled plastic waste. Adrian has a background in engineering and computer science, and has owned a smallholding and now owns a farm. His experience with making animal housing, and using recycled plastic planks to build a deck, convinced him that recycled plastic could offer many advantages over traditional materials, such as wood and metal, for making animal houses and other outdoor products. Further, by using the latest techniques, products could be designed to be functional, attractive and easy to assemble. Marcus has many years experience in 3D computer aided design (CAD), modelling and visualisation, and previously worked for the world’s leading CAD software company as a Technical Product Manager, presenting its 3D modelling programs all around the world. He uses this knowledge to ‘road test’ all designs on screen in 3D before they are physically created. He has kept numerous animals including chickens, ducks, peacocks, dogs, cats and green tree frogs!